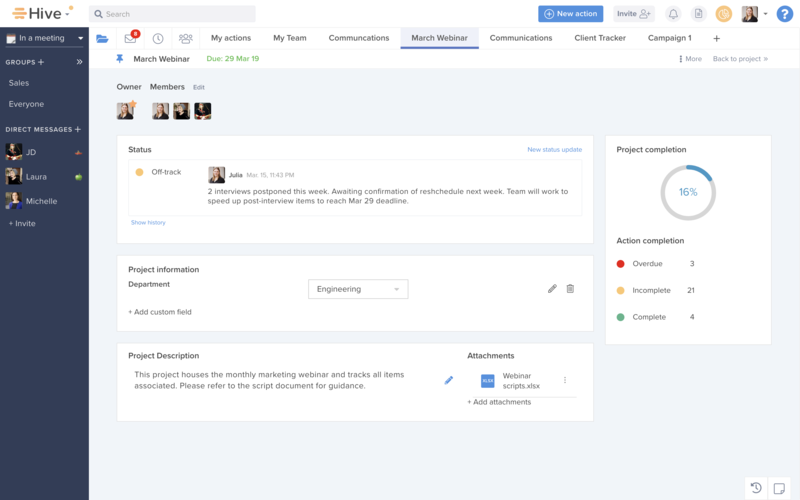 Each project's home page gives you and your team one place to track key project information. The home page is perfect for housing top-line project information and giving you a single destination to get a quick pulse on how the project is moving. See below for the many features the home page has to offer! Easily access and update project members and see the project owner. Project status houses status update history, so you can always see previous updates. Consult history to see how the project has been moving. Have a specific project categorization you want to document? Add a text or dropdown custom field to your home page. Custom fields are great for documenting project type, tier, or priority level. Project custom field inputs can be edited directly on the home page or from project navigator. Give clear direction to your team on the purpose of the project along with any key documents relevant to the project. Check in with the project completion dashboard to see how actions in the project are moving. 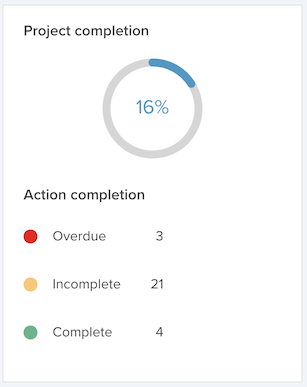 The dashboard shows the number of actions overdue, incomplete and complete. Tracking many projects? Project navigator gives you one place to see a rolled up view of your projects, including status, due date and any project custom field data. You can sort by these columns to get a quick idea of which projects are doing well and which may need a little TLC. Whatever your project, the project home page makes it easy to update project information, give it a little customization, and always stay up-to-date on progress.